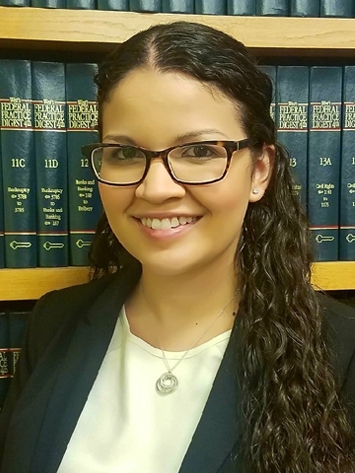 ANA RITA FERREIRA is an associate at Starr, Gern, Davison & Rubin, P.C., in Roseland, New Jersey. Within three years, Ana Rita received a Dual Bachelors degree in English and History from Rutgers, The State University of New Jersey in 2007. She received her Juris Doctorate from Rutgers Camden School of Law in 2011. Ana Rita became a member of the New Jersey Bar in 2011 and the New York Bar in 2012 and is also authorized to appear in the United States District Court, District of New Jersey. She joined Starr, Gern, Davison & Rubin, P.C. as an associate specializing in Personal Injury. Ana Rita has handled various types of personal injury matters including motor vehicle accidents, slip/trip and fall accidents, dog bite attacks, traumatic brain injuries and medical malpractice. She has successfully managed all cases from initial client intake through pre-suit investigation, initial pleadings, written discovery, motion practice, depositions, arbitrations, settlement negotiations, trials and appeals. She prides herself in excellent client relations and communication skills and thorough case review and presentation. Ana Rita was previously employed with the Sekas Law Group, LLC as a Senior Associate handling Personal Injury, Commercial and Residential real estate, Complex Commercial Litigation, solely handling Commercial Loan closings for a financial institution and other matters. Prior to her employment in Englewood Cliffs, Ana Rita was employed with Wanda M. Akin & Associates, for six years, as a Senior Associate, working on a wide variety of cases including Criminal Defense, Civil litigation, Personal Injury, Family Law (Marital Disputes, Child Custody and Support issues), Employment Law, Estate Law, Landlord/Tenant Law, Contracts and solely handled the Real Estate transactions for the firm. Over the past six years, Ana Rita has appeared in Federal, State and Municipal courts on both civil and criminal matters. Her experience includes receiving a Not-Guilty verdict after a two-week criminal jury trial in the Superior Court of New Jersey, Hudson County, trial co-counsel in a First Degree Attempted Murder/Kidnapping trial, in Essex County and in a Murder trial in Hudson County. Ana Rita also has years of experience arguing pre-trial motions in both civil and criminal matters as well as negotiating favorable settlements and dispositions. Ana Rita is fluent in Portuguese and Spanish.